3pk Oregon 20-1/4 Mulching Blade Caroni TC590N Finish Grooming Mower 59006200. 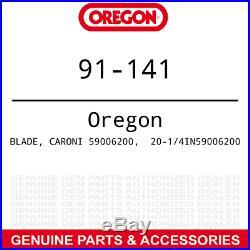 Set of 3 Oregon Mulching Blade Replaces OEM Part Number: Caroni 59006200. Genuine Oregon Product Replaces OEM Part Numbers: Caroni 59006200. Fits: Caroni TC590N 59 Deck Finish Grooming Mowers. Requires 3 blades for 59 decks. Superior mulching for bagging and discharge efficiency. The item "3pk Oregon 20-1/4 Mulching Blade Caroni TC590N Finish Grooming Mower 59006200" is in sale since Thursday, March 21, 2019. This item is in the category "Home & Garden\Yard, Garden & Outdoor Living\Lawn Mowers\Lawn Mower Parts & Accessories". The seller is "fix_my_toys" and is located in New Baltimore, Michigan. California Prop 65 Warning: Outdoor Power Equipment contain fuel, oils and fluids, battery posts, terminals and related accessories which contain lead and lead compounds and other chemicals known to the State of California to cause cancer, birth defects and other reproductive harm. These chemicals are found in vehicles, vehicle parts and accessories, both new and as replacements. When being serviced, these vehicles generate used oil, waste fluids, grease, fumes and particulates, all known to the State of California to cause cancer, birth defects, and reproductive harm.